Women's Contemporary Handmade Necklace : LOVE2HAVE in the UK! This women's contemporary handmade beaded necklace is the matching necklace with the logo bead silver bangle on our website. 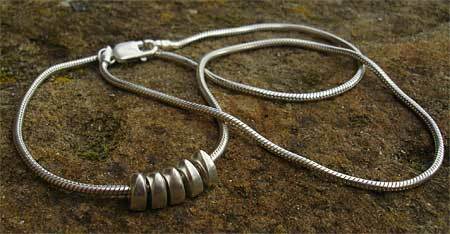 The snake chain comes threaded with several silver jump rings. There are five of these jump rings in total with each approximately measuring 5mm in size. The snake chain is 1.5mm thick, and 16 inches in length but other lengths are available on request. 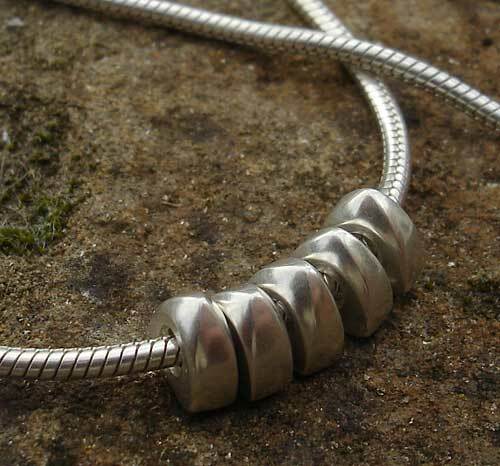 The threaded jump rings freely move around the necklace making it a unique piece of designer jewellery for a woman.